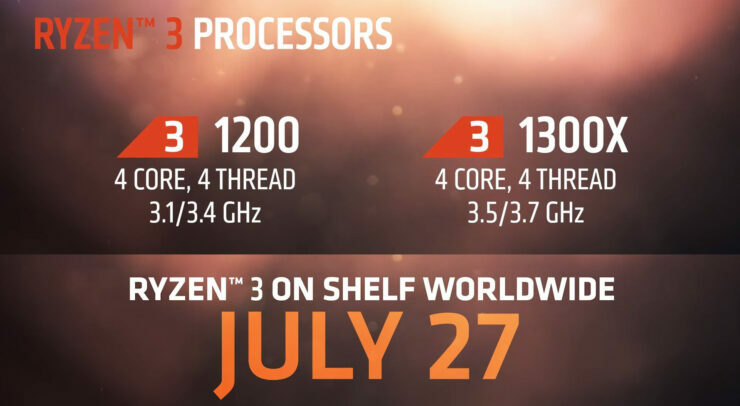 AMD revealed some official details about the Ryzen 3 lineup recently and while these are the same as what we told you about, pricing information for the same has leaked out via Reddit. The source of the information is apparently a distributor in the user’s country. According to him, the Ryzen 3 1300X quad core CPU will retail for $129 and the Ryzen 3 1200 processor for $109. 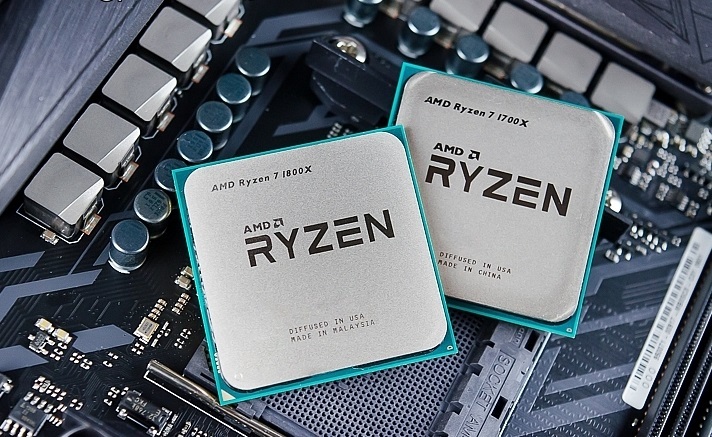 In a live stream recently, AMD confirmed that the Ryzen 3 1300X will be a quad core die clocked at 3.5 GHz (base clock) with turbo up to 3.7 GHz. The Ryzen 3 1200 will be clocked at 3.1 GHz (with turbo up to 3.4 GHz). These are exactly the same specifications as their pro variants which the company has already revealed. We have also previously seen performance information of these chips and they are not to be taken lightly – they are certainly not HTPC-only processors. The Ryzen 3 lineup will be quad core dies (2 CCX) with no SMT for a net total of 4 cores and 4 threads. Each core will retain the full 512 KB per core L2 cache but only half of the 16MB L3 Cache will be active. TDP of the chips will remain at 65W. Since the price of the Ryzen 5 1400 is $169 and AMD usually prices its chips in increments of $20, we expected the Ryzen 3 1300 and Ryzen 3 1200 to be priced at $149 and $129 respectively. However, according to this leak, the actual pricing will be $129 and $109 – which is absolutely insane value considering these processors pack some serious performance for the buck. 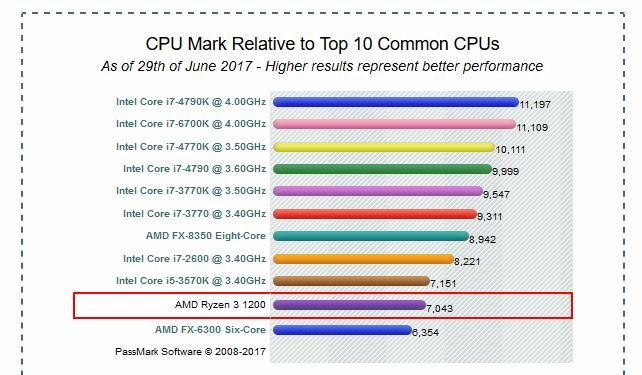 The Ryzen 3 1200 scores 7043 Points in their benchmark. To put things into perspective, an Intel i5 3570k at stock clocks scores 7151 points and an i7 2600k at stock clocks scores around 8221 points. This means that you are looking at a performance level that’s not just for HTPC builds, this is horsepower that can actually handle moderately heavy gaming loads. You can find the Passmark entry for the Ryzen 3 1200 processor over here. Considering this is i5 level territory in terms of compute performance, the processor should easily be able to handle light to moderate loads in terms of gaming. While more CPU intensive games will probably not fare well, this is definitely a step up from the budget processors of old which were only really good for HTPC or NAS purposes. It remains to be seen what the overclocking potential, if any, of this chip is going to be since that is the one variable that will truly help drive sales of this particular SKU. All in all this is a damn good bang for the buck (or as good as it gets anyways) CPU for the average joe. Deals On Huawei P20, OnePlus 6 and Xiaomi Mi Mix 2s – Limited Quantity!